Are you unknowingly skewing your website's statistics? Blog > Business Website Tips > Are You Unknowingly Skewing Your Own Website’s Statistics? Are You Unknowingly Skewing Your Own Website’s Statistics? Leaning back in my chair I thought, “Hmmm. Something is definitely not right here.” I quickly skimmed through our new client’s monthly website statistics reports again, in case I’d misread the numbers. But no, something definitely wasn’t right. The stats showed a suspicious (obviously inflated) number of repeat visits happening at suspiciously similar times. A small bit of detective work uncovered that a very large number of our new client’s employees had the company website set as their browser homepage. This means each time one of those employees fired up his web browser, the stats program had counted the visit, ultimately contaminating the company’s website’s statistics. Thus, their statistic reports had been failing to accurately portray how many “real” visitors had been arriving at their site’s homepage. By tracking internal/employee visits (and the visits of regularly-visiting webmasters!) businesses, government offices, and organizations often unknowingly collect visitor data that can decrease the clarity and usefulness of their stats reports. 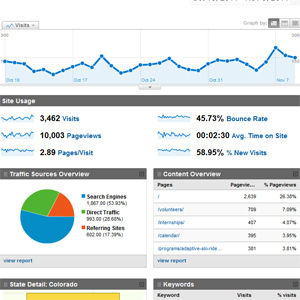 Are you, too, tracking your (and your employees) visits to your own website? If you’ve never taken an action to prevent your own tracking, the answer very well could be Yes. First, determine your IP address by visiting this page and looking at the big numbers displayed at the top: http://www.whatismyip.com. Click the “Edit” link located at the far right in the row that lists your website name. In the Filters Applied to Profile area, click “Add Filter” on the far right. Enter your IP address in the boxes below. Repeat for additional IP addresses you’d like to block (for example: your office IP address or your webmaster’s/web company’s IP address). This is a simple solution that anyone with access to their Google Analytics account can implement. Keep in mind, however, that although this solution may satisfactorily address skewed data issues of very small businesses, blocking visits by IP address alone is far from comprehensive. For example, the technique doesn’t address the issue of dynamic IP addresses. If you’d like to consider more extensive or detailed visitor blocking, ask your webmaster or web company what solution would be most effective for you. Or of course, feel free to ask us!